Small groups create Loving Relationships - they are a safe, non-threatening environment to bring to people to. A Small Small Group (4-6 people) is really good for bonding people together at a deep level. I call this a mentoring group, but it is true - they tighten the knot of friendship and trust. Even if members of the group have known each other for years, spending time in a Mentoring Group will draw them even closer as they share and care for each other. Church is the launching point for loving relationships. It is not the place to grow them. Just to start them. To grow the relationships you need to take the people somewhere else. A small group is a perfect place. A social event is good. A meal together in your home, a cafe or restaurant. Anything that is conducive to group discussion and mixing. Who do you want in your church? What age group? What type of person is your primary target. Once you have that figured out, put those type of people as greeters in your church. Their presence as welcoming faces will say, "This is who we are here!" Put a lot of effort into making people feel welcome. Snacks. Drinks. Room to mix and mingle. Open discussions. People trained to mix, mingle and laugh! Observe the traffic lights! Know people well enough to know when to stop, when to slow down and when to go! Know when it's ok to move to the next level with people in their faith journey. This can only happen when you have an healthy active relationship. It is very important to develop real relationships with people. Small groups are the perfect environment for growing meaningful relationships. Saying "I don't know" is an equaliser. A great way to connect with group members or personal friends. Having all the answers can be a real barrier for new people. Not knowing everything is bonding and comforting! Friendships take about 18 months to build from scratch to the point of serious religious questioning. Therefore the relationships need to be real and build on common ground. Relationships built on the “I’m gonna make this person a Christian!” basis will be very difficult to maintain. Find a common interest and build on that. Love them to Jesus. Last night after 1pm someone backed a trailer into our driveway and began to steal a pile of wood that we had yet to stack. The neighbour lady, Flo, saw them and called the police. She then let her dog out – a tiny terrier barely big enough to bite your knees, but loud enough to scare your pants off. They quickly left without very much wood at all. This afternoon, after we returned from church Flo came over and told us about the encounter with the thieves. We thanked her for her vigilance and care for us as neighbours. Then her son drove into the drive. I told him the story and he told me one that will go down in my all time favourite stories told over the back fence! A retired friend of his had noticed that a small portion of his wood pile would disappear on a regular basis – every couple nights. He figured that it was someone living nearby that was stoking their fire with his pension-bought wood. So, he engineered a solution. He drilled a hole in a good sized piece of wood. He then packed the hole tightly half-full with gunpowder. He took the sawdust from the hole and plugged the hole cleanly and replaced the wood on the pile. A few days later there was a resounding boom from a house three doors down and the chimney collapsed. No wood was ever stolen from the wise old man's house again! I love that story! Imagine… Oh, just imagine! Often we are very quick to attempt to correct peoples 'wrong' believes. We see something in their lives or their theology that doesn't match up to the scriptures and we quickly try to right their wrongs and iron out their wrinkles. Jesus often chose a different strategy. In John 5 a story is told of a blind man that is ultimately healed by Jesus. In this story there are three 'false beliefs' that are encountered by Jesus. It is interesting how he deals with them. Jesus does not jump on the inaccuracy and pound it into shape. He actually uses all three as launching pads for his ministry. The third misconception is seen in John 5:14. This one is interesting because Jesus actually quotes a commonly repeated phrase when he meets the man again. He tells the man, “Now you are well; so stop sinning, or something even worse may happen to you.” It was commonly believed that all sickness and ailments were curses from God based on the actions of the people who were sick. Jesus refuted this in John 9, but here in john 5 he quotes it as if it is Gospel! What is Jesus saying? He knows he’s got a captive audience. He’s speaking to a man who he’s just healed and the man is living on Jesus’ every word. So are the people around the man listening to the conversation. Jesus begins teaching about his true nature as the Son of God. Then he explains his use of the misconception, “Those who listen to my message and believe in God who sent me have eternal life. The will never be condemned for their sins, but they have already passed from death into life.” Now the lame-no-longer man understands what Jesus meant when he said, “something worse may happen to you.” Without Jesus our sins condemn us. With him in our lives our sins are gone. We have passed from death into life. Jesus is telling the man, and everyone listening, that ignoring him – going our own way – is suicide. Following Jesus and His law is life. Go and sin no more – that is the lifestyle of someone who has seen Jesus and understands their new eternal nature! It’s not a threat. It’s a promise! In our ministry for Christ we could learn a very valuable lesson from Jesus’ example in John 5. He allows misconceptions and uses them to grow the individual as well as the crowd. But, he spends a fair bit of time planning how he will work it all together. Jesus does not ignore the wrong theology. He uses it to launch into a greater work than theological haggling. The end result is the person comes closer to Jesus and they have a more accurate understanding of his Word and will. Next time you encounter someone who believes differently than you, pause before you act. How would Jesus use the difference to launch his ministry into their hearts? Go for hearts, not points. Value people, not proof. Give them Jesus, not a lecture. And in the end they will come to understand the truth. But first they will encounter Jesus and know his love! The Christian life is a journey. Each stage with Christ is marked by something different for each Christian, because each journey is different. We all have the same Saviour, but our experiences with Him are as unique as each snow flake that falls from the clouds. The chapters of my walk with Jesus have been clearly marked by very memorable events. The first was my Baptism in 1984. Then, in 1989 I was changed while on a fly-and-build to Honduras when I saw true poverty for the very first time. 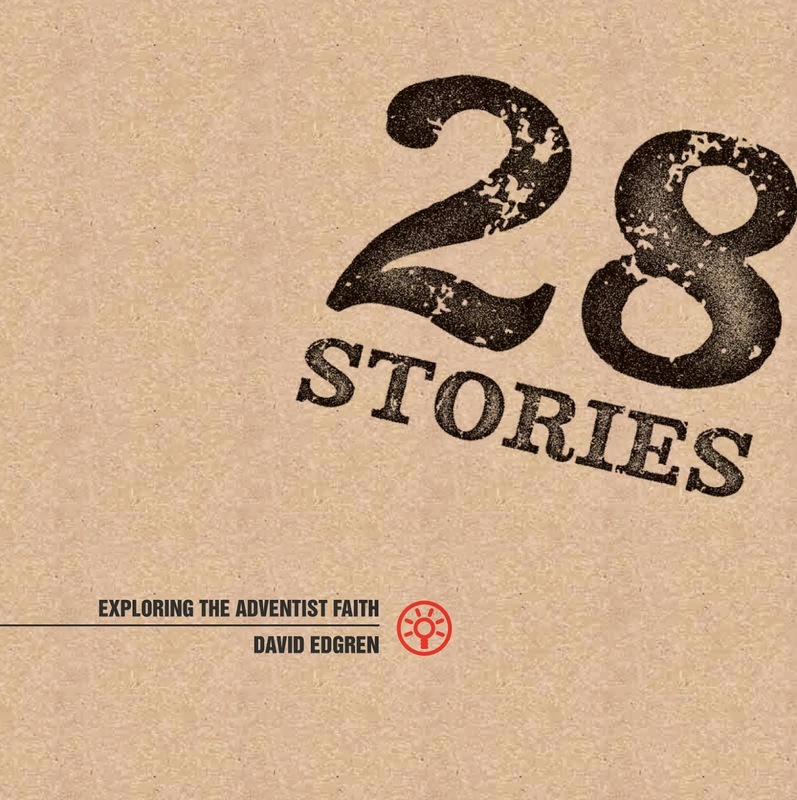 The next was in 1999 when I baptised my first new Christian – an experience that changed me in ways I cannot explain. And most recently, on August 4 2003 When God gave me the gift of Leadership in a vivid encounter with Him. All of these events are things that are highly experiential and yet extremely factual for me. What have your moments of reality been with Jesus? What changes has God made in you? How have you grown? How have you been humbled? Think through your Christian walk and write down your journey milestones. Then share them with those you love. It will change them. It will change you. And it will glorify God! On August 4, 2003 I had an experience I will never forget. In fact, it is one of those few and far between pivotal moments that change ones life forever. As Chaplain of Nunawading Adventist Primary School I had taken the four school captains to a “National Young Leaders’ Day” held in Melbourne. There were hundreds of school children and some very distinguished guest speakers. For my entire life I have always considered myself as primarily a creative thinker. I joined teams, boards and clubs with one goal in mind – to share my gift of creativity. While I often got placed in positions of leadership, I never considered myself a leader. I worked with leaders. I supported their success by providing lateral thinking and creative ideas. From that moment forward my personal relationships have become fields of influence. I now see myself as a naturally creative thinker with the spiritual gift of leadership. I have recently begun studying with an insiprational young adult who is finding God for the first time in her life. Sarah-Jayne and I are going through the Try Jesus Bible Study Guides and she is really enjoying them. Have a look at Sarah-Jayne's blog to see what she is finding valuable in the studies! I am really enjoying studying with Sarah-Jayne because of how fresh her faith is. She is so real, so searching and so joyous in what she finds. There is nothing like leading someone to Jesus. The opening presentation for the LEAD Weekend was present by myself and looked at creating an environment in our church that is comfortable for new people. 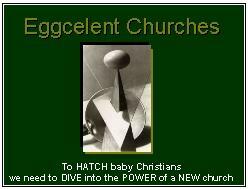 The title of the presentation was Eggcellent Churches and was interactive and enjoyable. Have a look at the slides and notes and then let me know what you think! What evangelism ideas can you share? What is the most simple to implement evangelistic idea you have seen in practice? There were a number of highlights at the LEAD Weekend. We had a good sized crowd. There were just over 30 people who came on Friday night and stayed for the entire weekend. What a great group of people! The sharing, singing and networking was great. Of those thirty only a few were from the same church. So the general mix was really good with a few people from many churches. Perfect for a time of learning and networking! The worship was wonderful. Jason Cook and his worship team led us in times of beautiful music in which we entered the Lord’s presence! Many people commented on the wonderful music. 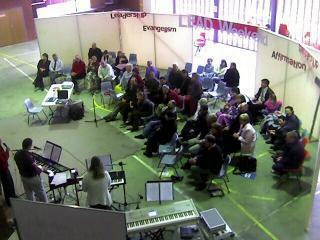 The three corporate sessions on Sabbath were well attended (over 50 people were in attendance on Sabbath!) Pr Norm Hardy was up first and challenged us with “What everyone should know about Sabbath School and Small Groups.” Next, Julie Westlake inspired us with “What everyone should know about Children’s Ministry.” These two sessions were geared to give people a foretaste of what would be happening in the workshops with these two speakers. Many people said they were encouraged by the two presentations and the workshops ran by Julie and Norm were well attended. The 11 O’clock service on Sabbath was taken by Pr Karl Winchcombe – and what a POWERFUL challenge he gave us! Karl is to personal evangelism what Harley Davidson is to Road Bikes – he is the benchmark! He showed us a clear picture of the Christian life that demonstrated that we are the most effective in our Christian outreach in the first three and a half years after conversion. After those 3.5 years are gone we tend to become institutionalised Christians and loose our connection with the world – therefore loosing our ability to reach the lost. Karl challenged us to constantly look for opportunities to get reinvolved with the lost in order to build authentic relationships so that we can lead them to Jesus. Thank you Karl! The rest of the weekend was taken up, mostly, with workshops. Pr Kevin Amos ran a very insightful and informative series explaining a model of church health based on the four types of people in our churches ranging from new people to spiritual leaders. Pr Norm Hardy lead a group of people in an exploration of how to make the Bible come alive in Small Group and Sabbath School discussions. Julie Westlake explored evangelism to kids and running Sabbath School’s that really reach our children. 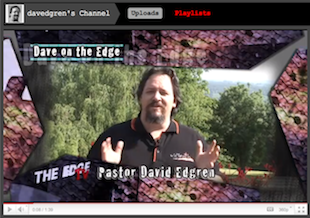 All three presenters were highly appreciated and their ministries have touched Tasmania’s church leaders! On Saturday night we had a games night. It was a bit of Adventist fun! We popped balloons, played with play dough, had some fun with words and even explored some of Ellen White’s evangelism challenges in a game of charades! What a wacky bunch of people! It was great fun! The weekend was concluded with a challenge from our President to be a “People Winning People.” Thank you Kevin for your ever present model of servant leadership. You are an inspiration to all who know and work with you. Thank you to everyone who came for the weekend and especially to everyone who made it happen. Dave and Bronwyn McCrostie were wonderful hosts providing delicious food and an ever helpful nature! Soraya was such a very important person in the promotion and presentation of the event. Thank you Soraya! Jenny created a fantastic design for the environment that gave the event a professional look and a functional structure! Thanks Jenny! And especially to God, who was there the whole weekend and lead in everything we did. See you next year at the LEAD Weekend. I am so excited about this weekend! It has been in the dreaming stage for over a year, in the planning stage for six months and in the bitting my nails stage for about two weeks. And it's going to be awesome! 1. Our own Pr Kevin Amos will be inspiring his class with chruch growth and health material. 2. Our division Children's ministry director Julie Westlake will be teaching us how to reach kids for Christ. 3. SNSW's Personal Ministries and SS director Norm Hardy will be explaining how Sabbath Schools and Small Groups can be maximized to reach the lost. I first saw the idea of a Training weekend modelled in Victoria where I minstered before Tassie. In Vic they have GT Weekend and it is very good. Lots of streams, lots of guests, lots of people. Here in Tassie we have less people to train and therefore can only bring a few speakers each year. So, we have gone for three major areas of importance - kids, groups, and church health. All three of these are eveangelistic in nature and therefore we will be Highlighting the E in LEAD this year. Jesus couldn't help it. Wherever he went, whoever he was talking to - no matter what the situation - Jesus was able to speak to that person, in their context, in contemporary language. He spoke to a Samaritan woman at a well of water and true love (John 4). He shared with a Pharisee in a dark back street of the true nature of God and Man (John 3). He knelt and spoke to a lame man by a pool offering healing through him rather than through superstition (John 5). And he spoke to a power hungry mob of thousands telling them of the bread that comes from heaven (John 6). Jesus knew what people wanted. And he knew what they needed. He bridged this gap ever so carefully and creatively. He was the master story teller, the supreme parable weaver, the King of connecting. Jesus spoke and people understood. He loved and people were healed. He touched and people were blessed. After spending a night in prayer, focusing on doing, saying and living the Father's plan he met the people who wished to crown him king. It was the Father's plan to send living water, the bread of life and everlasting life. Jesus presents to the misguided crowd the very answer they all need. John 6:40 states, "For my Father's will is that everyone who looks to the Son and believes in him shall have eternal life, and I will raise him up at the last day." Jesus wanted them to understand that all of his stories, all of his parables, all of his healing, and all of his miracles were teaching one ultimate lesson. God was heaven-bent on saving mankind. Eternal life is God's plan for everyone who meets Jesus. The last day is in the cards for all people - Because He sent His Son. Our words, actions and gifts today should be focused on the same target. His mission must be our mission. Without Jesus the world is lost. We must offer them Jesus. And when we do, Jesus will do the connecting - that's his spiritual gift! Driving home from prayer group tonight, Mikey said something very humorous that I think we can all relate to! We were talking about the appointments that we have this week. This lead to Mikey's insightful question, "Dad, is there a voice doctor? Because sometimes my voice gets cranky!" And he MEANT it!!! Wouldn't it be great if there was someone we could see, or something we could take that would make our voice unable to complain? :) Perhaps that is Mikey's future role! But, until Mikey grows up and helps us all, where can we go to change our attitude? There is only one place to go - to the cross. There is only one person to go to - to Jesus. John 4:22, 25 - In the New Living Translation ... "You Samaritans know so little about the one you worship, while we Jews know all about him... The woman said, "I know the Messiah will come--the one who is called Christ. When he comes, he will explain everything to us." The Jews spent 100's of generations trying to explain the scriptures and to define God. The Samaritan's (this one at least) had a different strategy. Faith! Her answer, "The Messiah will come! And when he does he will explain everything." Which is EXACTLY what Jesus has just been doing! No wonder she recognised and believe Jesus when he said, "I am the Messiah!" Meanwhile, the disciples were urging Jesus to eat. "No," he said, "I have food you don't know about." "Who brought it to him?" the disciples asked each other. Then Jesus explained: "My nourishment comes from doing the will of God, who sent me, and from finishing his work. Leading people to salvation brought Jesus such joy that even his physical needs were satisfied (or at least forgotten!) by finding and reclaiming the lost fo the Kingdom. When you are doing something that abosrbs all your energy and concentration you often forget about food, drink and even sleep. This is obviously the way Jesus was about sharing himself with others. Oh, that we would be the same!